A lot of you guys are interested in the new map format, how will it look like. How will you make maps in link-dead? I explained how it will work in my previous posts, but now since it is pretty much done I can show you some real life examples. To check how this looks in the game just check this post New mighty lighting effect. Everything should be clear there, although that video doesn’t use the effect map yet. Ambient map – a bitmap with colors and shades which blends with the real-time shadows and lights. Basically if a region is bright or white on the ambient map it will be lit in game even if there is no light source there. Effect map – a bitmap with colors and shades which blends with the weather effects like fog or rain. This is used so that some parts of the map don’t have rain pouring in or fog on them. For example the inside of the building is drawn white so that the effects don’t render there. Collision map – a simple different colored bitmap used for creating the collision map. Each color of pixels represents different collision types. Just like different poly types in Soldat. All these bitmaps are imported into the game map builder. In the builder you can add everything like lights, respawn points, set doors and anything like that. Then you bake the entire thing into one single map file. All the files used for the map will be in one file. There won’t be any problems like missing sceneries or textures in link-dead. What about the file size? This map is 2000×1000 pixels large and its weight is 1.5mb. Which isn’t bad, I guess final link-dead maps will be under 10mb, which is something Counter-Strike players live with every day. But it can be easily less with the cost of quality because I use an adjustable compression format called PGF. — Each color of pixels represents different collision types. What types will we get? My gosh, that looks pretty. The weather effects alone are astounding for a mere 2D side-scroller. Wow that looks nice mm, it’s really coming together now. You are my authority in creating new way out of problems, mainly that is seenalble in programing. You made impression on me when You said that there is no good script for lights in 2D so You had created Your own :). I am ensure that i will public my snake to you if it will be worth of it (i think You shoud suspect to recive from me mail: “Help!! It’s not working! Please help me!”” but anyway i have a lot of good intensions) . It looks really good, but in my opinion the lights are too bright. You said the game was almost done, we haven’t seen any weapons yet, havent’ really seen any gameplay either. Or vehicles, besides at the start. Wow… I’m speechless… Good job. Mapping looks a bit complicated but nice. Hm… What do the different colors of the collision system represent? I’m going to guess that white means everything collides eh? Whoa, I can see the maps in this game are going to be reeallly nice. This game becomes better and better with every post..
WIll there be any type of public beta? Or one we can sign up for whenever that time arrives? Ah, so will the actual terrain layer will be a bitmap? From the art, it looks like a bitmap. But from the way it interacts with the lighting (soft shadowing) it looks poly-based. Also, will it be limited to a set resolution, like Soldat originally was? Or will you implement the ability to change resolutions? And if so, will there be much point, given it looks like you’re rendering at a set resolution, with bitmaps, anyway? Wouldn’t the bitmap be converted into polygons? this game is gonna dominate. Yesh im just wondering. what guns will there be in this game is it going to be the same as soldat or..? Great job Michal! I’m really impressed with the image showing soldier covered in green light. Could explain it in more detail later? To be exact: how is it rendered that in green light everything is green – which is actually realistic light behaviour. Do you apply ambient layer on the rest with some special alpha-blending options – or is it something more advanced? Anyway: looks great so far! No one knows in the beginning Just search for some tutorials on he web and try to experiment with the code they provide. You’ll see progress in no time! im kinda skeptic about the collision map being a bitmap. i imagine it will be converted to vectors, but it seems unlikely that the engine would be capable of converting the bitmap without either losing some fine detail, or making the output too high poly. The collision map works fine, maybe I’ll let you see how it works in the future. You can set the level of detail you want. All the lighting is drawn on top of the background and sprites. The effect is achieved using blending techniques. I blend the ambient map and a texture with the lights and shadows. You’re learning, just enjoy the process and in a couple weeks you’ll be fluent in programming. It’s all about practice hubis. Keep practicing in whatever language and you will become fluent in it. You are a machine, Michael. How do you work so fast? Anyhoo, this game looks like it has enough old school gameplay to be fun and enough new gameplay to make things more interesting. Nice! Can you adjust the amount of light a specific light source has and the light on the map? At first i thought the rain was really shoddy then i realized you saved the picture in jpeg format 😀 Looks good keep it up. A question though, when do you think you will be able to release details on weapons, vehicles(If they are added, I’ve got no idea if they are) and teams and the such. I am rather interested in the whole hacking thing you stated in earlier updates. Anyways sounds good and looks good Well done. What is green color in collision map? 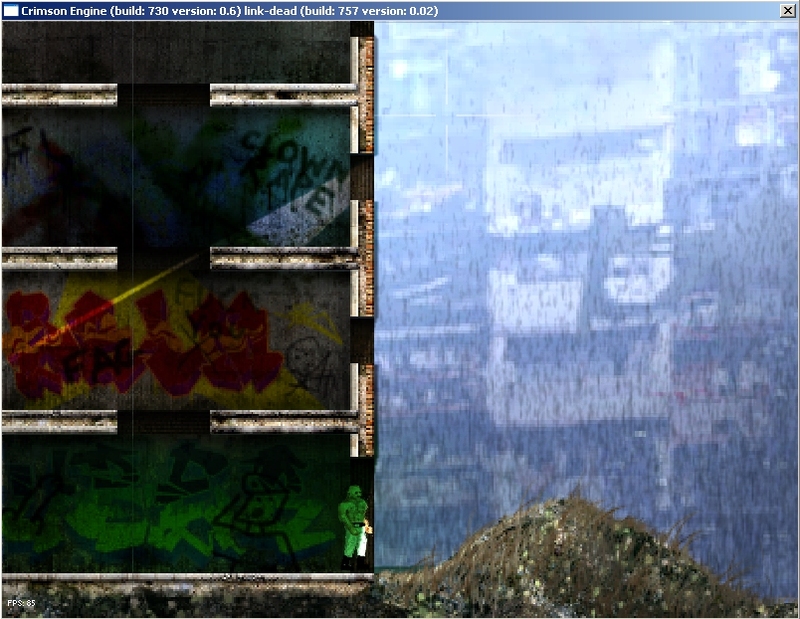 hmm PGF, shouldn’t a good 2d game have bitmap compression without quality-loss? I hate compression artifacts, even if the are very minimal. It destroys the pixel art. There are no visible compressions artifacts with high quality PGF compression, it’s really an awesome format. Everything will be controllable via the editor. Great question! That is like a platform that you can walk on but you can jump off of it too. Like in platformers. We’re still polishing the design, but I think we’ve got 80% of it done. There’s a lot of brainstorming involved and we change things constantly. When are you going to implement shirts? And will there be females? I don’t understand the mapping process completely, but i can always screw around with it when the game comes out. Looks great by the way. I think you may have gone a bit overboard with the lighting, but then again that was probably just to make it clear what’s going on. The lighting is completely necessary. Will there be destructible walls? “The lighting is completely necessary. Lemme rephrase that. Of course the lighting looks awesome and is necessary. What I meant was that there was too much of it, most likely to make it more noticeable. Given the way the lighting interacts with the terrain, I’d say that you’ve got the actual bitmaps as textures on the terrain polys – just like soldat, but with higher detail, and a surface (top side, like grass) on the ground. This game is gonna PWN, the lighting is perfect and i can’t wait, although the map making looks difficult. 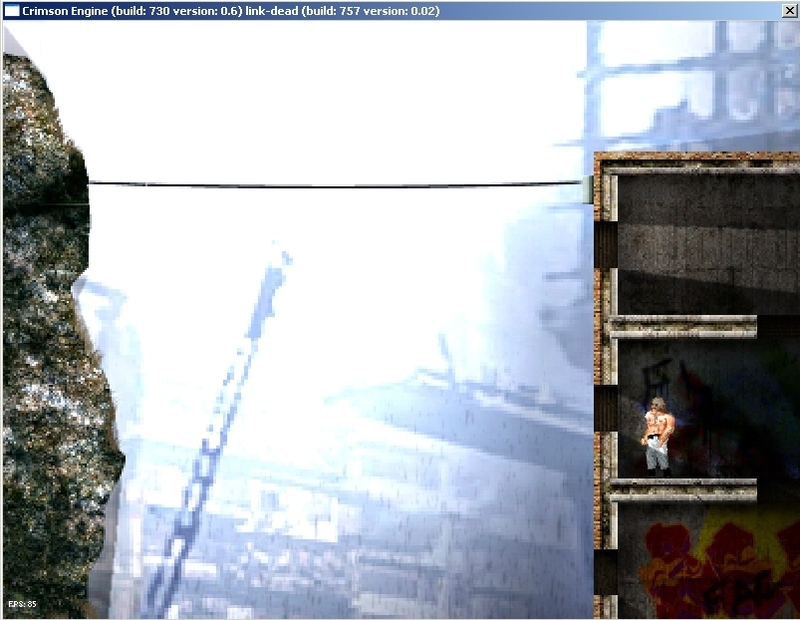 Plz post some gameplay, or make us a demo, plus i hope you can edit the game like in soldat (eg. mod weapons and vehicle stats) and i hope you networking code is fast.